Former Arkansas Gov. Mike Huckabee told conservative radio host Laura Ingraham that the restaurant owner who refused to allow his daughter to eat at her restaurant followed Mrs. Sanders’ family to another restaurant and harassed her. Turns out that her protest against Sanders and Trump– cost her her job. 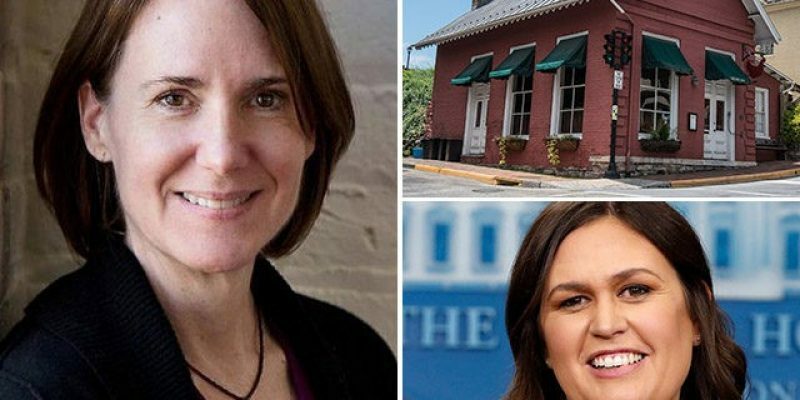 Fox News reported that Stephanie Wilkinson, owner of the Red Hen in Lexington, Virginia, resigned yesterday from a local community organization she previously directed called Main St. Lexington. Wilkinson made headline news for refusing to serve Mrs. Sanders and her family. Sanders tweeted that she politely left the restaurant. Monday morning President Trump weighed in. “There’s a part of that story that hasn’t been told, you’re going to be the first to hear it. Once Sarah and her family left, of course Sarah was asked to please vacate, Sarah and her husband just went home. They had sort of had enough. But the rest of her family went across the street to a different restaurant. Huckabee also mentioned that Wilkinson missed a great opportunity to have “a thoughtful discussion about her political differences” with his daughter. But Wilkinson wasn’t interested in doing that. She was only interested in spewing ignorance and hatred. Ms. Wilkinson told The Washington Post that she told Mrs. Sanders and her family to leave “as a protest against the policies of the Trump administration.” She said that she asked to talk to Mrs. Sanders and then told her to leave. “I was babbling a little, but I got my point across in a polite and direct fashion,” Ms. Wilkinson said. “I explained that the restaurant has certain standards that I feel it has to uphold, such as honesty, and compassion, and cooperation. Except Wilkinson wasn’t compassionate towards Huckabee’s family, nor was she cooperative in serving them a meal. At the end of the day it cost her her job. Stephanie Wilkinson stepped down as an executive director of Main Street Lexington, a non-profit organization tasked with promoting economic viability, Fox News reported. Elizabeth Outland Branner, the president of the organization, accepted Wilkinson’s resignation Tuesday morning, WSLS reported. Guess Wilkinson can’t cooperate with her local neighbors either. What a tolerant feminist she is.